Rajgira flour is made from the seeds of the amaranth plant. There are many members of the amaranth family, of which some are grown primarily for the seed. Amaranth flour can be used for making gluten free food or as fasting/ vrat food (in India). The amazing thing about amaranth is how it compares nutritionally to other grains: far more iron, calcium, protein, manganese, fiber, and other phytonutrients than wheat or rice. Amaranth is one of the most protein-rich of any plant-based food, rivaling that of animal-based foods like cheese. 1. In a mixing bowl add Rajgira flour, salt and mix well. Add green chili paste, crushed cumin seeds, turmeric powder and mix it again. 2. Now take the boiled potatoes, peel the skin and mash it finely or you can grate it, then add into the Rajgira flour mixture. 3. Add salt and mix all the ingredients properly, knead it and make a dough. Add little water about 1 tbsp if required. 4. Keep the dough coved with cloth aside for 15-20 mins. 5. Now heat the oil in a deep pan for frying. 6. Take the dough and divide it into small sized balls (key lime size). 7. Take one ball, flatten it between your hand palms, dust it with dry flour and roll it into the circle/puri. 8. Use same method for remaining balls and roll out more Puris. 9. Now deep fry the rolled Puris one by one into the hot oil till puff and becomes golden brown both sides. 10. Drain it from excess oil using the slotted spoon and remove it on paper towel. 11. Rajgira Ki Puri is ready to serve. You can have it with fasting dishes like spicy peanut potatoes or fasting curries and enjoy the festival. • You can skip the green chili paste and cumin if you want. Rajgira Ki Puri also call Amaranth Flour Puri. 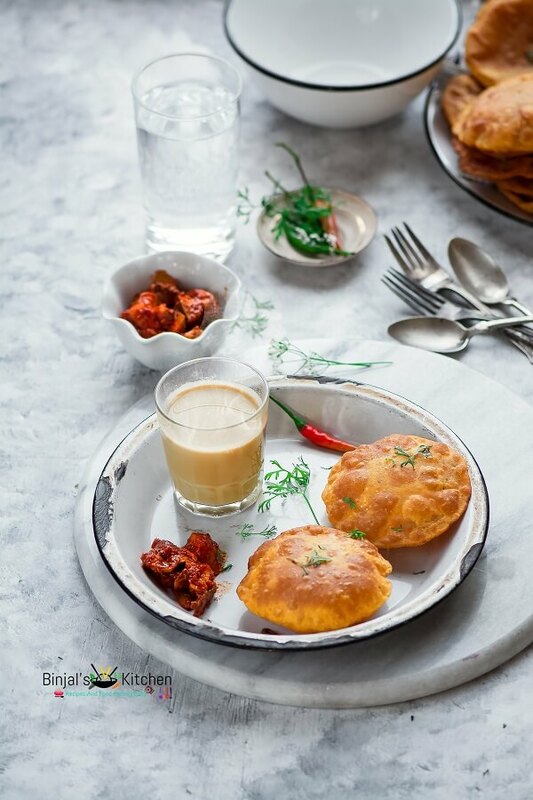 Rajgira Ki Puri is perfect for fasting or any Indian vrat. 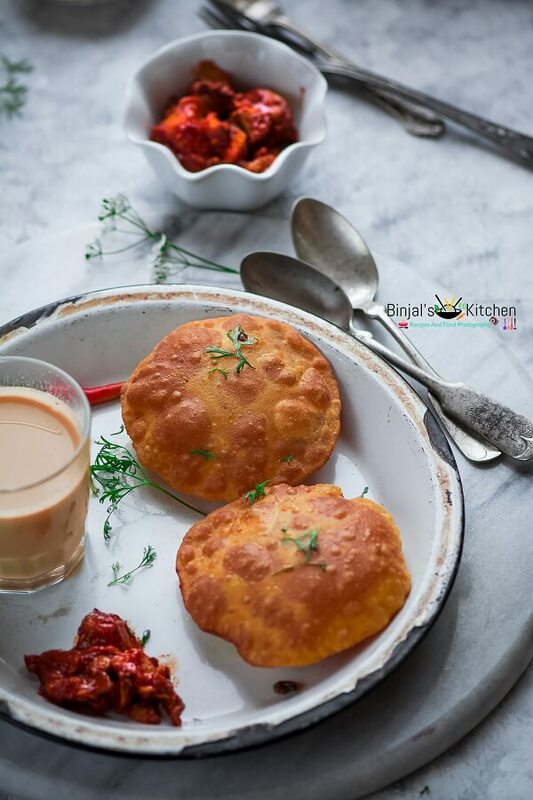 Rajgira Ki Puri is also best as a gluten free recipe. Rajgira Ki Puri is most popular during Navaratri fast in North India. 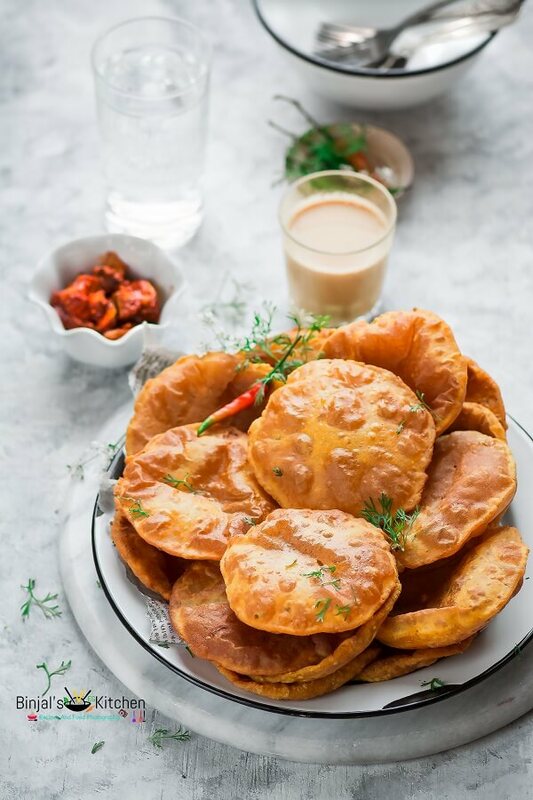 This Rajgira Puri can be served with any side dish like vrat ki sabji, aloo ki sabji, sweet potato sabji or kaddu ki sabji etc.… serve Puri with any of these and enjoy your fast. In a mixing bowl add Rajgira flour, salt and mix well. Add green chili paste, crushed cumin seeds, turmeric powder and mix it again. Now take the boiled potatoes, peel the skin and mash it finely or you can grate it, then add into the Rajgira flour mixture. Add salt and mix all the ingredients properly, knead it and make a dough. Add little water about 1 tbsp if required. Keep the dough coved with cloth aside for 15-20 mins. Now heat the oil in a deep pan for frying. Take the dough and divide it into small sized balls (key lime size). Take one ball, flatten it between your hand palms, dust it with dry flour and roll it into the circle/puri. Use same method for remaining balls and roll out more Puris. Now deep fry the rolled Puris one by one into the hot oil till puff and becomes golden brown both sides. Drain it from excess oil using the slotted spoon and remove it on paper towel. Rajgira Ki Puri is ready to serve. You can have it with fasting dishes like spicy peanut potatoes or fasting curries and enjoy the festival.